The automated Client Report is out, and it’s now a part of the Advanced Client Report. In the previous article we looked at how to set up scheduling, the cost and perks. There are a few more hidden gems I want to share with you, and the history of this tool, which has been present in all of the key moments here at ManageWP. 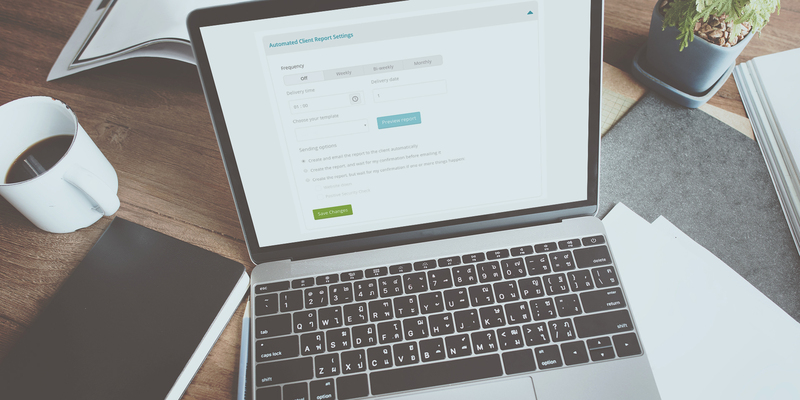 The obvious addition is the automation and scheduling of Client Reports, but while we were focused on Client Reports we thought we should add a few more goodies. 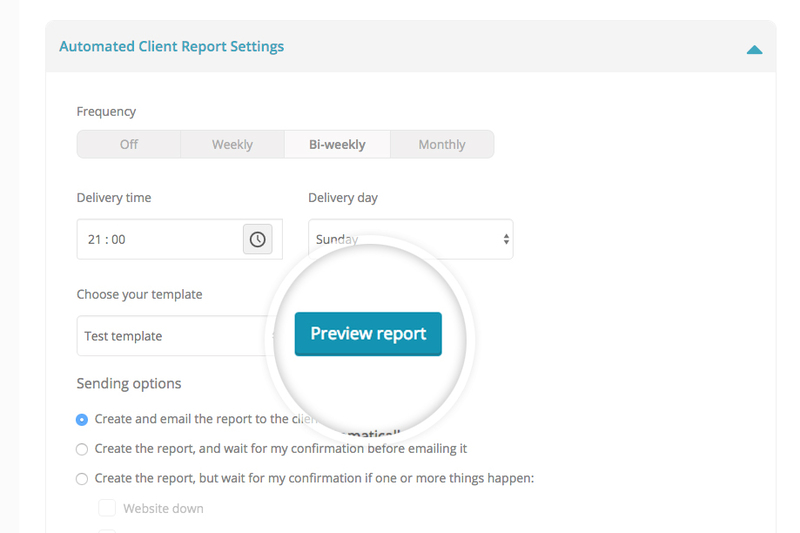 When creating a Client Report, next to the scheduling options you will see a preview option. This will allow you to see what the report will look like. This should make things easier. 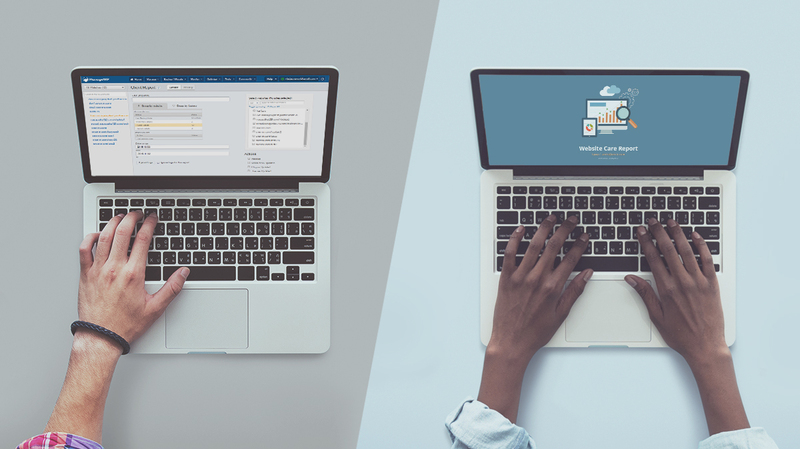 Check out your work from the dashboard, get a new tab with a full Client Report, and be sure you are happy with the report before sending it to your clients. Scheduling just got better. Thanks to your comments, we found out that you are interested in also having a bi-weekly sending option. You told us. … So, we made it happen. 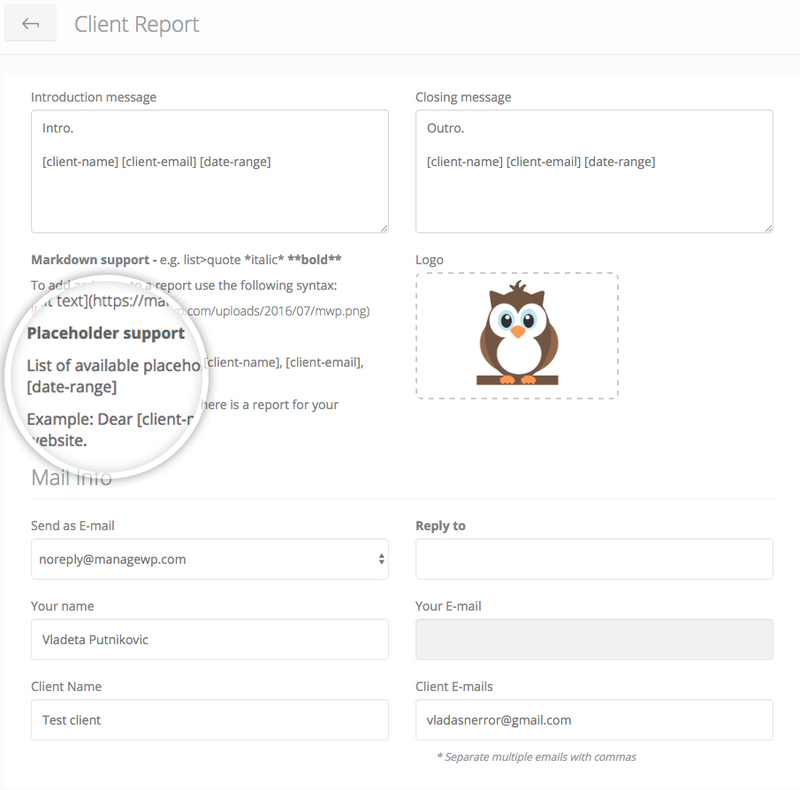 Another great thing we added are the placeholders, which you can use in your Client Report templates. Under the markdown support we already had in our templates, we added the option of being able to include [client-name], [client-email] and [date-range]. 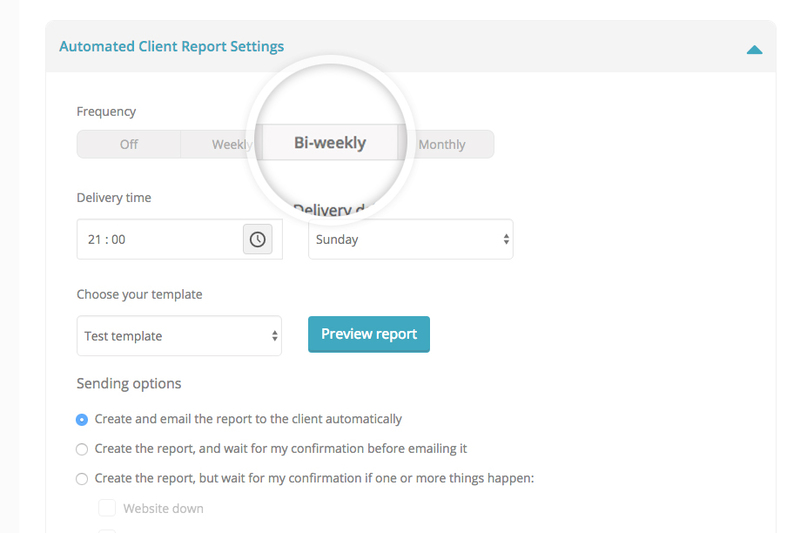 This gives you the option of personalizing your Client Report even more. This is an important note regarding the date range for monthly scheduling. Some of you might notice that the available dates are from the 1st to the 28th. This is to make sure it doesn’t come to any confusion, if you select the 31st on a 30 day month, or if it happens to be a leap year. We are feeling slightly nostalgic, so here is a quick look back at Client Reports throughout the ManageWP history. On March 11th in 2013, Tom made the first announcement about Client Reports, calling it ManageWP’s best new feature, and rightly so! 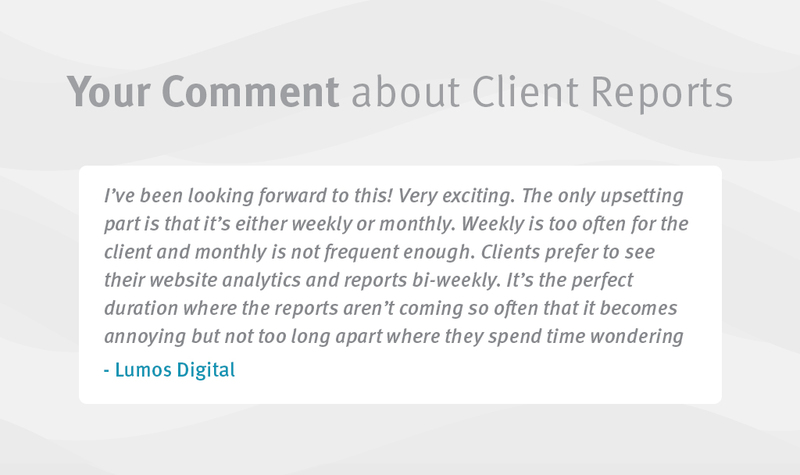 Client Reports have revolutionized the way we communicate with our clients, it’s a feature that we are particularly proud of. We realize the potential this feature has, and with each stepping stone we are looking to make it that much better. The next big change to our Client Reports came with the new dashboard, and was announced on May 20th 2015. The main changes were made to the UI, making Client Reports clean, elegant and professional. Here we talked about the road ahead, and today we are happy that we hit another milestone we set last year. Here is a snapshot of the past and present of Client Reports. The next thing we will focus on is localization. Our user-base and more importantly your user-base is growing, and becoming more international. We appreciate that most of you have a good grasp of the English language, but we understand that some of your clients may not. Also, how much more personal is a report in your native language? Paying attention to the language of your Client Report shows that you are seriously committed to your work, and we want to help you do this. The future of Client Reports means being able to translate every line of the Client Report. We just need you to be patient with us, and stay tuned for updates on when this will happen. Thank you for taking this journey with us, for your feedback, patience and gratitude. I proudly present to you our completed 2016 automation map. Great new feature that I shall be implementing with my clients early 2017, saves a lot of time! Here’s to many new features in 2017 – Happy New Year! When is it planned to launch the additional languages ​​in client report? Is Spanish one of them? A very good news! Thanks! I need it and i love it! I do agree with the others, having my email as sender instead of managewp would make a huge difference. Instead of clients getting worried abt virus etc from an unknown sender, they will see that their supplier has increased its service. Not all clients are web-savvy … It wd be lovely if you could condider it for the coming versions. Thanks and have a nice day! If you need any more information or you are unsure, you can always contact our support. They are happy to help. Your service just gets better and better! Thanks for adding this invaluable resource, it will prove very effective in my communications with my clients. Thank you thank you thank you! I agree with Jillyn, if the automated emails are sent out using ManageWP email and marked as such then I probably wont use the automated reports. I use the white label addon so it would be pointless to then send out reports from an ManageWP email address. It would be much better to be able to set a personal default email service or even set the sending email address per site. So excited to have this new functionality available! Is there a way to set the email message that goes to the client and ensure that the report is delivered from my connected email address rather than the standard ManageWP address? Just picking up on Jasons point of having to add a client for each website, is that the best way to enable the reports for each website? I have quite a few websites and each are individual clients. Yes that is the most efficient way of doing it. 🙂 It basically means you don’t get confused about your websites, but you can manage them according to your clients. Very nice! Excited to use this! I do wish it was possible to do on a per website basis and not only per client. I have clients that sub to us and therefore want each report split by client. I can probably just make a client for each website, but it would be nice not to have to. Yes, I know what you mean by “Was it sent?” and we are working on it. You will be able to see an icon telling you if it has been sent. That should be implemented soon. Right now I can’t use client reports as the multi site reports just look too confusing and feel like you are reading the same thing over and over again. Any chance that the layout/flow will be improved soon for reports that have more than 1 site in them? I know what you mean. It is something to look into certainly. I will take it back to our dev team, and let them know. appearing or taking place 1) every two weeks or 2) twice a week. We are excited, as well. Bi-weekly is every two weeks.